آلمان دیلی is co-official in South Tyrol; فرانسه دیلی is co-official in the واله دائوستا; سلوون دیلی is co-official in the تریسته اوستانی and the قوریتزیا اوستانی; Ladin is co-official in South Tyrol, in Trentino and in other northern areas; ساردینیا دیلی is co-official in Sardinia. The .eu domain is also used, as it is shared with other اوروپا بیرلیگی member states. ایتالیا (ایتالیاجا: Italia)، رسمی اولاراق ایتالیا جومهوریتی (it. Repubblica italiana) – پایتختی روم شهری و اوروپانین جنوبوندا بیر دؤولت دیر. اهالیسی: تخمینا 58 میلیون نفردن عیبارتدیر. نژادی قروپلار؛ ایتالیالیلار – 98%، آلمانلیلار، ایسلوونلر، آلبانلار، یونانلار، فرانسه لیلر. اورتا اوزون‌عؤمورلولوک (1992-جی ایل اوچون)؛ کیشی‌لرده – 74 یاش، خانیم لاردا – 81 یاش. دوغوم میزانی (هر 1000 نفر) – 2. اؤلوم میزانی (هر 1000 نفر) – 10. ↑ Foreign citizens 2017. ISTAT. آرشیولنیب اصلی نۆسخه‌دن on 6 August 2017. یوْخلانیلیب15 June 2018. ↑ National demographic estimate, December 2017. ISTAT. آرشیولنیب اصلی نۆسخه‌دن on 6 August 2017. یوْخلانیلیب15 June 2018. ↑ ۴٫۰ ۴٫۱ ۴٫۲ Report for Selected Countries and Subjects. ↑ Gini coefficient of equivalsed disposable income (source: SILC). Eurostat (15 June 2017). آرشیولنیب اصلی نۆسخه‌دن on 4 March 2016. یوْخلانیلیب24 June 2017. ↑ Legge Regionale 15 ottobre 1997, n. 26. Regione autonoma della Sardegna – Regione Autònoma de Sardigna. ↑ Comune di Campione d'Italia. Comune.campione-d-italia.co.it (14 July 2010). آرشیولنیب اصلی نۆسخه‌دن on 30 April 2011. یوْخلانیلیب30 October 2010. Hacken, Richard. 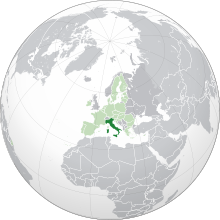 History of Italy: Primary Documents. EuroDocs: Harold B. Lee Library: Brigham Young University. یوْخلانیلیب6 March 2010. FastiOnline: A database of archaeological excavations since the year 2000. International Association of Classical Archaeology (AIAC) (2004–2007). یوْخلانیلیب6 March 2010. 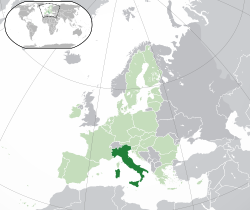 Italy History – Italian History Index (Italian, English). European University Institute, The World Wide Web Virtual Library (1995–2010). یوْخلانیلیب6 March 2010. Italy. عوموم دونیا فکتلر کیتابی. مرکزی کشفیات ایداره‌سی. بۇ صفحه‌‌ سوْن دفعه ‏۱۴ دسامبر ۲۰۱۸، ‏۲۳:۱۵ تاریخینده دَییشدیریلمیشدیر.